« Sushi. It’s what’s for dinner? I apologize for the delay with this post. I know I promised you a recipe with the leftover sushi rice, and you are probably thinking that your sushi rice is over a week old now. But the truth is, I didn’t post because I wasn’t inspired by the name of this recipe. I mean, “baked rice balls”. That’s what is going to motivate you run into your kitchen and start pulling things out of your fridge? That name was going to make you believe that if you make these, you are going to have delicious goodness coming from your oven? And to top it all off, this is the only picture I have from the prep. Appetizing. I wasn’t convinced, and don’t really think that you should be either. But believe this. 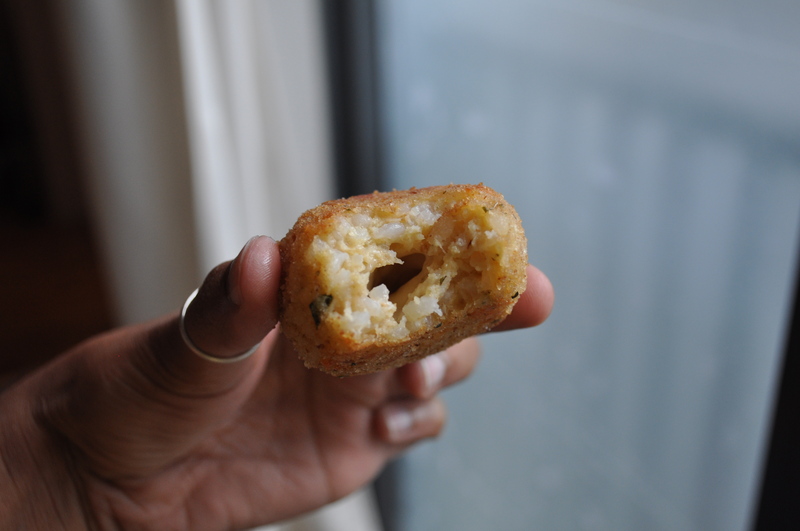 These little goblets of starchy, seasoned rice, with a surprise bite of smoked cheese inside are the best, most delightful, certainly the most delicious savory snack that has come out of my kitchen since…well, ever. You should be walking, no running to your kitchen right now to get these started. They’re that good. And if this doesn’t convince you, well, then, the name will have to do. Your choice. The original recipe was to use up leftover risotto. Feel free to use that as the rice base, omitting all of the seasoning. And play around with the cheeses – smoked cheese just happens to be one of my favorites. Also, the original recipe was for frying. I don’t do that – mostly because I don’t know how. So I’ve adapted the recipe for the oven. Like all things that are supposed to be fried and are baked instead, I’m assuming that these do not have as much crunch as their fried original. But, my gosh, they are tasty. So give this method a whirl. Breading: Put the bread crumbs in a medium bowl. Set aside. 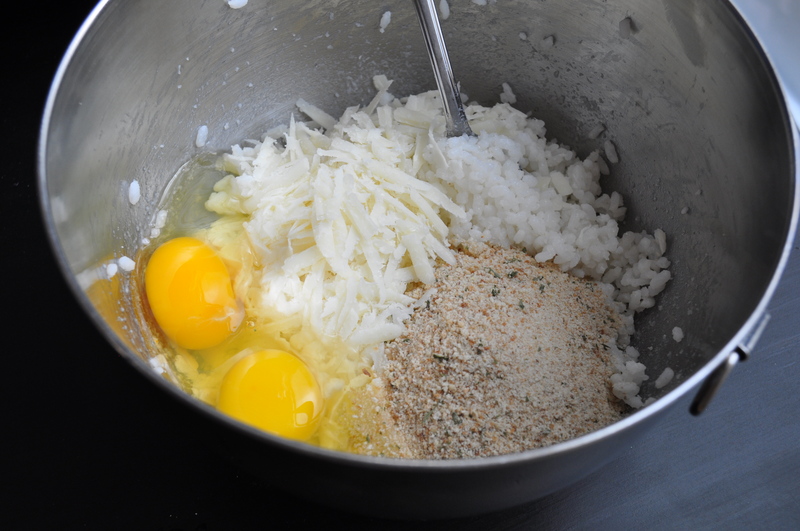 Filling: In a medium bowl, combine the sushi rice, salt, garlic powder, onion powder, red pepper, bread crumbs, Parmesan, and eggs. 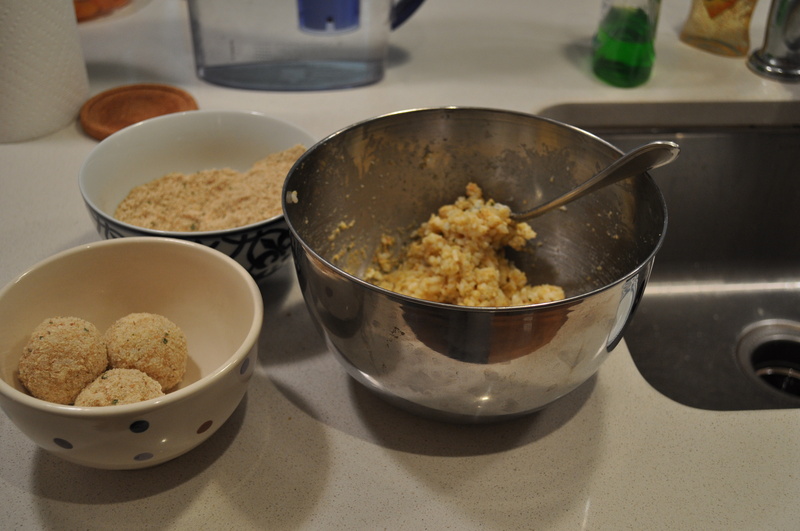 With damp hands, using about 2 tablespoons of the risotto mixture, form the mixture into 1 3/4-inch diameter balls. 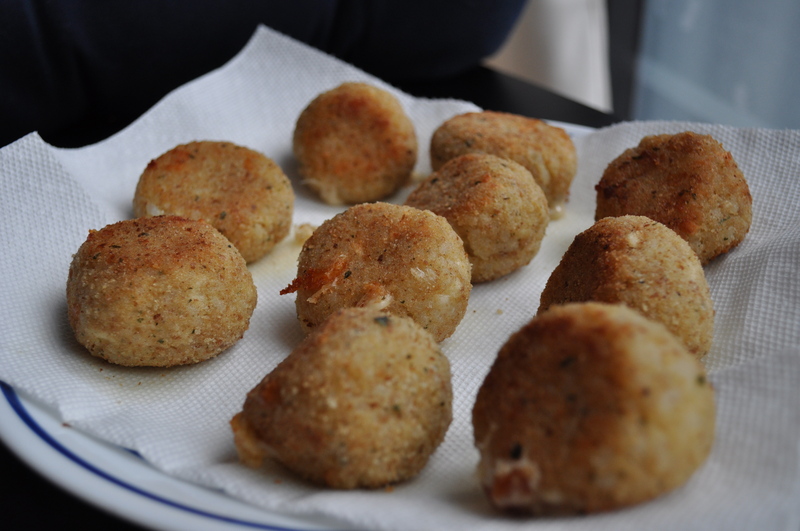 Make a hole in the center of each ball and insert a cube of smoked mozzarella. Cover up the hole to completely enclose the cheese. Roll the balls in the breading to coat. Line a baking pan with olive oil. Put the prepared balls in the baking sheet, making sure that they are all fully covered with the oil. Bake for about 25 minutes, or until golden brown, making sure to turn the balls mid way through the baking. This entry was posted on	August 11, 2010 at 11:14 am	and is filed under savory, Uncategorized. I can attest to the ooey gooey goodness of these rice balls! I had 4 of them as a ‘pre-dinner snack’ and had to restrain myself from having more! They are seasoned to perfection, and let’s face it, you can’t really go wrong with melted smoked cheese! arancini with sushi rice!! yummmm! These are delicious. I used hot-spiced, smoked Gouda. Can anyone tell me calories and fat content per ball? Can I prepare these ahead of time and then pop into the oven to warm up again? Yes! Just stick them in a 300 degree oven until they are warmed through – around 15-20 minutes.